"I have come to the conclusion that one useless man is called a disgrace, that two are called a law firm, and that three or more become a congress!" Standing deep in thought at the tower on the roof of Independence Hall in Philadelphia, John Adams (William Daniels) mentally prepares for another assault on his fellow members of Congress. When it�s time to return, he rushes down the stairs and immediately continues his rant about choosing independence. The time is June 1776, and a pivotal moment in the early stages of the United States is occurring. A divided group of colonial leaders hardly agree on anything, and a unanimous positive vote to endorse this revolution seems impossible. Luckily, John Adams can sing to make his point, which makes everything more festive and dramatic. 1776 brings the widely acclaimed Broadway musical to the screen with almost its entire original cast and major crew intact. It adds a few more characters for dramatic purposes, and the setting becomes larger, but the movie still retains the atmosphere of the original play. William Daniels (St. Elsewhere, Boy Meets World) stars as John Adams, the energetic Boston native considered obnoxious and hated by many of his fellow Congressmen. His goal is independence for the American colonies from England, and he will not rest until they approve this action. However, Adams cannot even get enough votes to approve a debate on the issue. A brilliant intercession from pal Benjamin Franklin (Howard Da Silva) convinces Virginian Richard Henry Lee (Holgate) to make the proposal. With wonderful aplomb, Holgate dances and sings about the success of his acclaimed family. One of the most entertaining scenes in the film, this moment opens the doors to independence. Director Peter Hunt and writer Peter Stone must walk a fine line here between serious political discussion and enjoyable musical pieces. Both men participated in the Broadway production, but their task becomes more difficult when playing to a film audience. Luckily, the talented cast of stage veterans sells the historical accuracy with strong dialogue and belts out the tunes impressively. Once you accept the fact that John Adams, Thomas Jefferson, and Ben Franklin will break out into song at any moment, the production is entirely believable. My historical knowledge is not extensive enough to discuss the accuracy of the events depicted, but they are superbly dramatized and do not seem too farfetched. Although our present-day viewpoint makes the creation of the Declaration of Independence seem fairly easy, there was a strong group of men within the Congress who voiced a powerful opposition to the action. The individual at the forefront is John Dickinson (Donald Madden)�a refined Pennsylvanian who still loves the mother country. His fiery debate with Adams early in the picture represents one of its finest dramatic moments. Dickinson also leads his followers through the originally cut Cool, Conservative Men, which is not one of most memorable songs performed. The other major opponent is South Carolina's Edward Rutledge (John Cullum), a refined Southern gentleman concerned mostly with his business interest. In one of the story's most compelling moments, he provides a passionate argument for the continuation of slavery in the colonies. Thomas Jefferson (Ken Howard) wrote a section into the Declaration abolishing slavery, but independence will never pass with the inclusion of the issue and so it is deleted. 1776 starts with an energetic bang of fervent debates and melodic songs, but it does sputter during a lengthy middle act. A few tunes virtually grind the story to a complete standstill, but the characters always recover and keep us involved in the ultimate outcome. Adams' moments with his wife Abigail (Virginia Vestoff) are especially touching, as it presents their very close relationship that keeps him going. In a similar vein to historic films like Apollo 13 and Thirteen Days, this story must work extra hard to keep the audience compelled. Luckily, the whimsical nature of the original musical exists on this screen translation. Bolstered by a score of colorful performances, the founding fathers' struggle for "independency" remains lively and poignant today. Image Transfer Review: 1776 appears in a decent 2.35:1 anamorphic widescreen transfer that is easily the best version released for home use. The colors are often bright and detailed, with the sharp outfits of the colonial figures shining forth effectively. The exterior scenes are especially striking and convey a realistic feeling of being in the time of the American Revolution. While this transfer contains impressive attributes, it also includes a significant amount of grain and blemishes. These defects probably could not be helped due to the status of the original print, but they do keep my grade from being higher. A few moments appear extremely hazy, particularly during the dark, indoor songs. On an overall scale, the picture presents the story efficiently, but some errors keep it from reaching a top-notch status. Audio Transfer Review: This release contains a clear 5.1-channel Dolby Surround audio track that nicely resonates from the front speakers. However, the surround sounds hardly exist and are only noticeable with very precise listening. The extensive dialogue and musical numbers are easily understandable throughout this presentation. Still, this musical could have benefited from a more extensive sound mix that would envelop you into the story. Once again, this effort does represent the best track available for the film, so its drawbacks are less frustrating. Extras Review: This "Director's Cut" of 1776 runs 25 minutes longer than its original theatrical presentation, which faced serious cuts from studio chief Jack Warner. The version included here restores the original credits artwork, extensive dialogue during the Adams/Dickinson debate on independence, and the song Cool, Considerate Men. Laserdisc owners should note that this length (166 minutes) is actually 10 minutes shorter than their version, which also features the overture and several extended tunes. During their feature-length commentary, director Peter Hunt and writer Peter Stone discuss the restored elements and the differences between the original theatrical form. Both men also worked on the Broadway play, so they possess considerable knowledge about its content. When speaking about the actors, they mention other plays and musicals in their career. This fact is especially notable because we rarely hear about the theatrical backgrounds of many film actors. Although Stone and Hunt do give a bit too much plot summary, the commentary is fun and also very informative. This disc also contains the screen tests for William Daniels, Ray Middleton, James Noble, Leo Leyden, and Robbins. Each piece runs for about a minute and shows each actor performing a pivotal scene from the picture. While not fascinating, this section is fairly unique and a worthwhile inclusion. The remaining supplements are a teaser for 1776 and the theatrical trailers for Oliver!, The Taming of the Shrew, and Pal Joey. The final preview does contain Frank Sinatra and several stunning women, but it is especially annoying because it runs for nearly five-minutes. Considering its possibilities for drama, the Revolutionary War has not received a very high level of film coverage (no, The Patriot does not count). 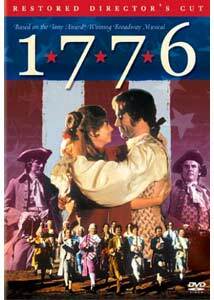 1776 tackles the dramatic conflicts in Congress while remaining entertaining at the same time. Benjamin Franklin, John Adams, John Hancock, and numerous other key figures come to life surprisingly well within the musical setting.